Missouri’s Bootheel is the ultimate southeast corner of the state, extending south and surrounded on three sides by lands in Arkansas, Tennessee, and a smattering of Kentucky. The area’s known for having fertile soil and vibrant agriculture but now that Pemiscot-Dunklin Electric Cooperative is deploying Fiber-to-the-Home (FTTH), it's also becoming known for high-quality Internet access. Jack Davis has worked in several fields. His tech career started when most people in the area reached the Internet via dial-up connections; at the time he worked as a network administrator for a local dial-up ISP in the 1990s. His second career was in agriculture and now he’s back in the tech field. Davis’s multiple work experiences have given him insight into the increasing broadband needs of rural residents who either farm or work in some other aspect of the agriculture industry. When Davis went back into tech, he joined Pemiscot-Dunklin because the electric cooperative, which had never had IT staff before, needed to fill a long-existing personnel gap. With approximately 8,800 connected meters, the cooperative is a modest-sized organization. Approximately 20 percent of their load goes toward irrigation, revealing the important role agriculture plays in the region. Internet access in rural areas is limited to fixed wireless. Cooperative members who used to subscribe to the wireless service typically found top speeds were around 3 - 4 Megabits per second (Mbps) download and much slower upload speeds. Caller ID spoofing, robocalls, and general spam phone calls are one of the hassles of 21st century life. This week on Community Broadband Bits, Christopher and Richard Shockey of Shockey Consulting talk about how the problem has progressed and what leaders in telecommunications are doing about it. As we transition from our old telephone system to one that involves session initiation protocol, commonly known as SIP, we create a new frontier for those who are finding ways to misuse the technology. Richard, with decades of experience in Data Communications, Voice over IP Technology, Numbering and Signaling, sits as Chairman of the SIP Forum. The SIP Forum brings together people in the industry to advise, advance, and consult on matters related to IP communications and services that are based on SIP. One of their challenges involves finding ways to improve the problems associated with caller ID spoofing, robocalls, and spam calls that are associated with SIP. In this conversation, Richard gives us a history lesson. He shares his technical expertise to help explain how market conditions, lack of investment, and the transition to the new technology have created a perfect environment for increased caller ID spoofing, robocalls, and the like. Richard describes the work of the SIP Forum and some of the challenges they’ve faced, which aren’t all technical. They have concrete plans to improve the situation, but rollout isn’t easy or quick. Policy, transparency, and rules are all issues that experts must address as they determine how we move forward. Learn more about the work of the SIP Forum at their website and sign up for one of their mailing lists to learn more about specific tech issues. As schools across the country look at their budgets, Janesville, Wisconsin, has decided to cut their future expenses with a fiber optic investment. This spring, the district will use E-rate funding to help finance a fiber optic local area network (LAN) in order to cut telecommunications costs by $70,000 per year. The school district will install 12 lines, eliminating leased lines and the associated expense. E-rate funds will pay for $1.6 million of the estimated $2 million project; the school district’s contribution will be approximately $400,700 and an additional $225,000 for engineering and project fees. School district officials calculate their contribution will be paid for in nine years. Fiber optic networks have life expectancies upwards of 20 years and in Janesville, District CIO Robert Smiley estimates this project will last for 50 years. At a recent Board meeting, Smiley told the members that the new network will be like transitioning “to our own private Interstate.” In addition to better prices, the new infrastructure will allow the district to ramp up speeds to ten times what they current share between facilities. The system Janesville School District uses now has been in place since the 1990s. The federal E-rate program started during the Clinton administration as a way to help schools fund Internet access and has since been expanded to allow schools to use if for infrastructure. School districts obtain funding based on the number of students in a district that are eligible for the National School Lunch Program. Funding for E-rate comes from the School and Libraries Program from the Universal Services Fund. Like many other schools that have chosen to switch to a district owned fiber network, Janesville sees a big advantage for voice communications. Due to the age of their phone system, they’ve had failures in the past. Last winter during a day of inclement weather, a large volume of incoming calls from parents overloaded the system and other parents who had signed up for emergency alerts on their phones didn’t receive them. With a new fiber network, the school district will be able to switch to VoIP. Chippewa Valley Electric Cooperative (CVEC) and local communications cooperative Citizens Connected are joining forces to improve Internet access in rural northern Wisconsin. The two cooperatives recently announced that they will invest in fiber infrastructure to connect residents, businesses, and schools through a new entity called Ntera. Construction will start in Holcombe, population around 300, because it’s one of the communities with the worst Internet access within the CVEC service area. Construction in Holcombe should begin this fall. Ntera will offer 1 Gigabit per second (1,000 Mbps) connectivity to premises in addition to voice and video. Rates have yet to be determined. CVEC’s service area includes approximately 7,500 premises within five counties. Citizens Connected has already invested in fiber infrastructure passing more than 3,200 premises. Holcombe is a census-designated place in the town of Lake Holcombe, where the population is a little more than 1,000. Even though they’d like to, Lake Holcombe schoolteachers don’t offer devices to students because so many of them don’t have Internet access at home. Superintendent Jeff Matin says that more than half of the students don’t have Internet access because it isn’t available in their home or just too expensive. Mastin is eager to have the improved broadband in the Holcombe area. Right now, there is Internet in the school building only. Just south of Mount San Jacinto in southern California, several small communities hope for better Internet access. The local cooperative has submitted a plan to build a next generation network fiber network further into Riverside County. Anza Electric Cooperative wants to expand its Fiber-to-the-Home (FTTH) network through another 200 square miles of its service territory. This $3.7 million project should connect another 1,200 residents to the growing network. Currently, Anza Electric is drumming up funding for the proposed project. The co-op already has about $1.5 million to put toward the venture and is now requesting a $2.2 million grant from the state. 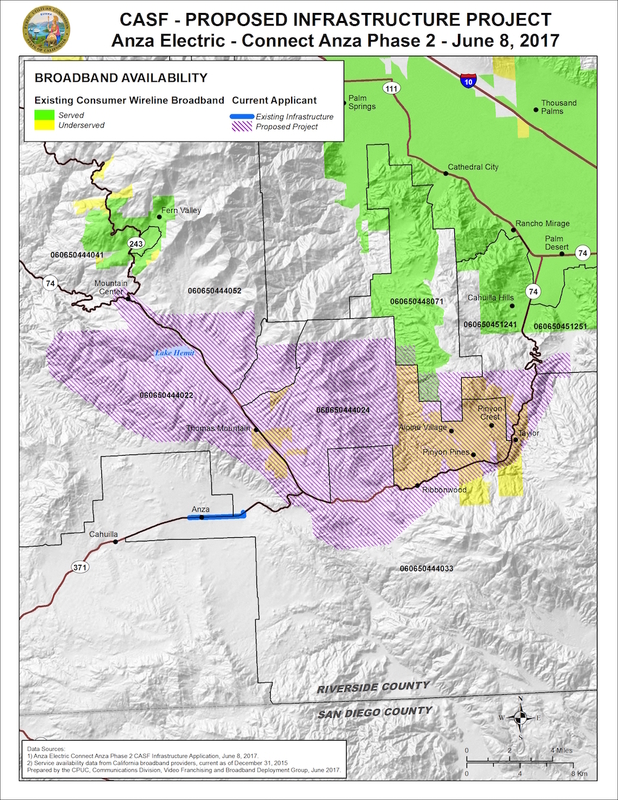 This network, called Connect Anza, will bring high-speed Internet service to several small, rural communities in Riverside County: Pinyon Pines, Garner Valley, and Mountain Center. High-speed Internet service of 50 Megabits per second (Mbps) will be $49 per month; service is symmetrical so upload and download speeds are the same. Residents will also be able to get phone service from the co-op for another $20 per month. Local fire stations and the Ronald McDonald camp for children with cancer will receive free Internet access through this project. The deployment continues Anza Electric’s previous project to connect more than 3,000 underserved households around Anza, California. The previous project was pushed forward by the overwhelming support of the electric cooperative’s member-owners, residents who receive electric service from the co-op. Anza Electric first started adding fiber optic lines for electricity management in July 2015. Later that year, at the annual cooperative meeting, more than 90% of members present voted to include fiber optics and high-speed Internet service in the cooperative’s bylaws. The vote encouraged the cooperative to continue to build fiber optic lines. Beverly Hills may be known for mansions and upscale shopping, but within a few years, it will also be known for fast, affordable, reliable connectivity. The city is investing in a citywide Fiber-to-the-Premise (FTTP) network for all homes and businesses, including apartments and condos, inside the city. The city (pop. 35,000) is a little less than six square miles and they receive electricity from Southern California Edison (SCE). AT&T and Spectrum (formerly Time Warner Cable) provide Internet access throughout the community but a 2014 survey as part of the city’s feasibility study indicated that 65 percent of respondents would “definitely or probably” switch to services from the city, if the services were offered. As part of the survey, 25 percent of respondents also want video and voice bundles; 86 percent feel using the Internet at home is important. While incumbents offer fiber connectivity in commercial areas of Beverly Hills, local businesses report that rates are expensive and they must pay for the cost of construction, which is also a big expense. At a recent City Council meeting when the Council approved funding for the project, the Mayor and Members expressed the need to be an economically competitive city. With Santa Monica, Culver City and Burbank nearby (all communities with municipal networks), Beverly Hills wants to be able to attract businesses looking to relocate or hold on to the businesses that need affordable and reliable gigabit connections. In an effort to improve local connectivity, Kandiyohi County will collaborate with a local cooperative, Consolidated Telecommunications Company of Brainerd (CTC Co-op). Kadiyohi County is in step with the increasing number of rural communities joining forces with cooperatives when big corporate providers find no reason to invest in less populated areas. In early July, the County Board of Commissioners signed a letter of intent with CTC Co-op in order to start planning for a potential project. The move improves the county’s chances to obtain one of the Minnesota Border-to-Border Broadband Program grants and motivates CTC Co-op to begin allocating some of its own funds toward a potential Kandiyohi project. Kandiyohi County is home to approximately 42,000 people in central Minnesota and covers approximately 862 square miles of prairie. The region, filled with lakes, is a popular fishing destination. Like many places well known for outdoor recreation, residents and businesses can’t obtain the Internet access they need to keep pace with more populated areas. Minnesota's Lac qui Parle County worked with the Farmers Mutual Telephone Cooperative when incumbent Frontier chose not to pursue a partnership. The county received funds from the American Recovery and Reinvestment Act (ARRA) but did not have the expertise or resources to maintain or manage a Fiber-to-the-Home (FTTH) network. Farmers Mutual, who already had experience after deploying their own network, stepped in and by 2014 residents and businesses had access to fast, affordable, reliable connectivity. Read more about the project in our report, All Hands on Deck: Minnesota Local Government Models for Fiber Internet Access. Incumbent providers, grown lazy on a steady diet of public subsidies and monopoly rents, have done their best to cast this as a debate between efficient private competitors and inefficient government monopolies. But it is the incumbents that would rather regulate than compete. They resist municipal entry not because it is incompetent – no one resists incompetent competitors – or because it is unnecessary. Rather incumbents resist municipal entry because they recognize the ability of local government to offer a genuine competitive alternative to a high priced monopoly or duopoly services.